Pedestrian injury in Maryland – When can you be sure of the driver’s liability? According to NHTSA (National Highway Traffic Safety Administration), more than 4,000 people are killed in vehicle accidents and more than 75,000 pedestrians are injured each year. Suffering a pedestrian injury in Maryland is an unfortunate thing, but it sometimes happens as a result of the driver’s negligence. With the help of a personal injury lawyer from Maryland, you can prove the liability of the driver and receive the compensation you deserve. The NHTSA defines as pedestrian “ any person on foot, running, jogging, sitting, lying down, walking, or hiking…”. On average, a motor vehicle injures a pedestrian every 8 minutes and kills one every 2 hours. If there is a sidewalk, the pedestrian must walk on it. If there is no sidewalk along the street, the pedestrian needs to walk along the shoulder of the road facing traffic. Pedestrians are subject to traffic lights, wait and do not walk signals, as well as all other pedestrian safety warnings and devices. Pedestrians must use their common sense. As a pedestrian, you have to be aware of the surroundings and have to be reasonable and prudent under certain circumstances. If you can remain out of harm’s way, as a pedestrian, you should do that. Even if the pedestrian has the right of way, they must continue to be vigilant and maintain a proper look-out, being able to act reasonably and prudently under certain circumstances. 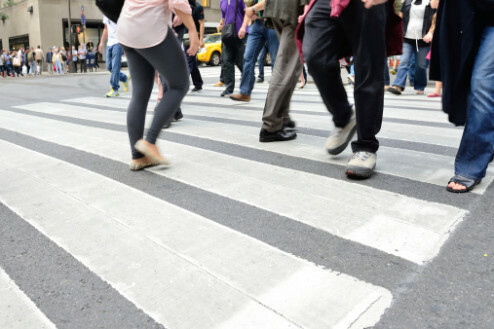 If you respected all your duties and suffered a pedestrian accident, you can file a pedestrian injury claim in MD with the help of an Annapolis injury lawyer. In some cases, the defendant will want to settle, but there are situations when the case becomes a pedestrian personal injury lawsuit in Maryland. That is why it is best to get the support of an Annapolis injury attorney. Distraction due to texting, eating, listening to music, putting on makeup, etc. With the help of an Annapolis injury attorney you can determine who is liable for your injury and if the motorist is at fault you can file a pedestrian injury claim in MD. If your Annapolis injury lawyer does not recommend pursuing a pedestrian personal injury lawsuit in Maryland, it is best to take their advice. Get the help of the best personal injury lawyer from Maryland at (443) 569-3950 or email us at [email protected].